Hello and welcome to another article. This one was delayed slightly due to the intervention of real life. As you might have noticed, this one looks a little better then the previous ones. The logo was made by pdv2506, he is the winner of the design-contest. As promised, I allowed him to make a wish. He wished for a Red and Green deck, with the card on the left in the message. What I did not tell him was... I will do an Extended legal deck this time, and since he wanted two colors, I will also do two decks. I hope that you folks will appreciate it, I will not do that regularly. Since this is a first, I made a poll in the boards, take a look and vote. The poll will be open for a week, and depending on the result I will bring you decks for various formats, or stick to STD legal decks. I guess that is about it. Oh, since I made the decks before FUS came online, they do not feature any cards from that set. I am also a tiny bit short on cards from that set. Therefore, it might take some time before I use FUS. Let us look at my first deck for today, it is a midrange deck that uses an underused artifact to negate the drawback on certain cards and turns said drawback into an advantage. The opponent will most likely be overwhelmed quickly once you have the parts together. How does this work? Earthen Goo and Ronom Hulk are creatures with the dreaded cumulative upkeep, but to keep track of the mana you need to pay CU uses time counters. This is where the Power Conduit comes into the picture, it can remove any kind of counter to place a +1/+1 counter on a creature, or to put a charge counter on an artifact. See the synergy? In your upkeep the goo and the hulk will produce time counters, which you will turn into +1/+1 counters. They will grow to imense proportion quickly. Earthen Goo already gets +1/+1 for each time counter on it, but this way you can keep paying only one mana to keep it alive and kicking. This deck is, as mentioned earlier, a midrange deck. You will use the burn and the small creatures to prepare yourself, the key to winning with this deck is to keep additional copys of the goo and the hulk in your hand, don't overcomit. Your opponent will most likely try to get rid of the elves first and you will be able to exhaust their removal so that you can safely keep creatures in your hand in chase someone feels the need to show you the Wrath of God. Pouncing Wurm is meant as a lategame-finisher, don't show that one too early. An entwinded Barbed Lightning is also nice to have once you can afford to cast it that way. I guess you folks want some gamelogs now, since I am going to give you another deck later on I will only give you two gamelogs for this one, and two logs for the other deck, which I suspect to be more enjoyable to most of you. Anyway, let's go to the casual room... I really hope that this deck is still working after the last updates. I win the dieroll, but my starthand is useless since it only contains 1 land, a Gruul Turf. A trip to Paris later, my hand looks like this: Mountain, Forest, Gruul Turf,Llanowar Elves, Power Conduit and Kodama's Reach. I keep that and begin with ye oldeforest, elves, go. He puts down a Forest and passes. I draw another turf, attack him with the elf, bring a mountain and play my Power Conduit. He just adds another forest to the table. I draw a Rift Bolt, play Kodama's Reach, grab a mountain and a forest and return themountain that got into play with it to my hand with a Gruul Turf. He shows a Plains and passes. I begin to wonder if he is manascrewed. I get another mountain from the top, play the mountain he already saw, attack with the elf and pass. At the end of my turn he cycles Akroma's Vengeance, uhoh. He shows me an Island, and gets his vengeance back thanks to an Eternal Witness. I think I am in trouble. A Llanowar Elves for me, I deploy a forest and the elf on the table and use my bolt to kill the witness. Attack with the ready elf, go. He plays Harmonize, plains, and discards Mantle of Leadership and Daybreak Coronet. I begin to think that he is playing a Retether.dec. My deck decides that I need another mountain. Oh, the joy of drawing lands. I play one and attack for 2, he is down to 15 lifepoints. He adds another plains to his lands and plays Akroma's Vengeance. He doesn't want todie to elvish beatdown. I draw Earthen Goo, finally. Too bad that my conduit is in my graveyard, well, Ihave more lands then I need at the moment. I play it and a turf, returning a mountain to my hand. His turn consists of Krosan Verge and Quagnoth. I need to draw something beside landon my next turns. I pay the upkeep and get a forrest, too bad I can't attack yet. He trys something, and undoes the landtapping, instead he uses sacrifices the verge and attacks me, I don't block. Yay, I draw my 2nd Power Conduit after I payed the upkeep. I play it, use it on the ooze and my opponent seems surprised. I attack with it too. Liefpoints, Me: 16, Him: 11. He plays Lightning Greaves and Nacatl War-Pride and attacks with it, for 6. I pay my upkeep cost, draw a Rift Bolt and wish that the greaves disappear. I deploythe mountain and attack into his beast. He doesn't seem to have a trick, and it dies.I aim the bolt at his head since the greaves protect his pride. He plays an enhanched Return to Dust, killing my conduit and his greaves. Man, I wishI had saved that bolt.. and then he clones his cats. He doesn't attack and passes theturn. I pay the upkeep, draw another reach, play it, attack and trample over one cat. He couldhave killed the ooze by chump blocking, but I don't complain. His turn is a bit dangerous for me, he plays Flight of Fancy on the pride, following itup with a Daybreak Coronet and hits me for 9. Oh, he also plays another Krosan Verge.I am down to a single lifepoint and kind of hope for a miracle. I draw my 3rd reach. My ooze is 7/7 by now, and I attack and hope for the best. Of course he doesn't block and I play my reach. He is down to 4, but I have only 1 point left and die to his attack. Well, this game was close, and I actually did my thing a few times. Not too bad, considering my bad draws. Let's try another one. I win the dieroll and keep a starting hand of: Forest, 2x Mountain, Gruul Turf,Llanowar Elves, Kodama's Reach and Barbed Lightning. I do the obvious first turn and pass. He brings an Island and an Imagecrafter. I draw a Rift Bolt and bring a mountain into play, reach out and bring another one onto the table, a forest is added to my hand. He drops a plains, Sunscape Apprentice and another crafter, he also attacks with the first one. I draw another reach, play the previously aquired forest and follow it up with the reach. This time I put the forest into play and the mountain in my hand. I suspend my bolt and pass. He brings the suspected forest and casts a Merchant of Secrets. He also attacks with his team. I shot the merchant down with the bolt and draw a Barbed Lightning. I cast it with entwineand kill the apprentice. My little elf attacks and I add my forest to my lands. He goes plains, Wings of Hope on Imagecrafter and attacks with the now flying wizard. 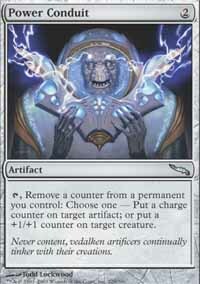 I draw another lightning, entwine it to kill the little crafter, attack and suspend a bolt. Oh, I also drop a turf and return one of the mountains. My bolt unsuspends and I hit his dome with it. At first it looks like he wants to do something against it, but then he lets himself get hit. I draw my Earthen Goo, attack with my elf, put the mountain back into play and cast the goo. He casts Hapless Researcher and attacks with the flying wizkid. I pay the upkeep for the goo, and draw another mountain. My two guys attack, he blocks the goo with his researcher, and sacrifces it with damage on the stack. He plays Selesnya Guildmage, Selesnya Sanctuary and an Escape Artist. He attacks with the enchanted grafter and passes. I pay my upkeep, the ooze is now 4/4, and draw my first Spark Elemental. I cast it and attack. He chumpblocks, but my tramplers put him at -2 and I win. Well, I won, even without the conduit, running excellent burn helped here. Overall, this deck can be quite fun when it gets going, but the one I will present next is a lot faster then this one. Fear the primal clubsandwich, the Primal Forcemage is the key-piece to smash face. 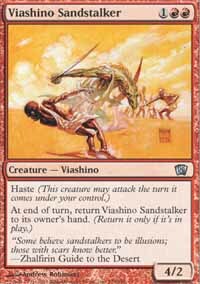 Theoretically you can play one on your second turn and follow it up with a Viashino Sandstalker, and that stalker will be a hasty 7/5 attacker. On your third turn. Glitterfang works similar good with the mage, and the Ronin Warclub beefs your forces even further up. It is very possible to do a turn 4 win with this deck. Your starthand should always include at least one forest, an elf and/or Lay of the Land. Forcemages and fangs or stalkers are fine, too. But don't forget that you need green and red mana for this to work, so keep in mind that manafixing is more important then the beaters until you reach the desired 2 green and 2 red manasources. Since this deck will need to use most of it's mana each turn, I decided to use cheap creature removal. Blazing Salvo certainly fits well in here, it hits a creature for cheap, or they decide to take 5 damage, this is good for setting up an unexpected large attack on your turn that most likely will end the game in your favor. Just remember, this deck is a fast aggro deck, deal damage whenever you can, don't hold back. I guess you want to see some gamelogs now, hm? Allright, I will dive into the depths of cas/cas again. I hope that I won't be eaten by a shark or something. I win the dieroll, seems I like always win it, and get a horrible starthand without lands.The next hand is: Terramorphic Expanse, Forest, Primal Forcemage, Kodama's Reach,Glitterfang and Viashino Sandstalker. I decide that I don't want to risk a worse hand and keep it. Expanse, go. He brings a tapped Overgrown Tomb and I search up a mountain. I draw another forcemage, play my forest and hope to topdeck a land next turn. He plays Orzhov Basilica and returns the tomb. In his cleanup, he discards a Scion of the Ur-Dragon. Grog hears my plea and let me topdeck a land, but... it's another expanse. pretty sure that he is laughing somewhere. Onto the table with it and go. I draw a forest, and play my first forcemage, followed by Glitterfang. I attack for 4 and pass. He replays the tomb, and casts a scion. I draw another sandstalker, play my second forcemage, again followed by the fang and attack for 7. He doesn't block. He attacks with the scion, during the declare blockers step he turns him into Numot, the Devastator, the ability triggers and he trys to target my mountains. Unfortunally we get a little lagspike and he selects one mountain two times and concedes. Well, I did have some luck here, but you might have noticed how fast the attack power of this little beast can increase, it is too bad that I won on a misclick, but a mountain from the top would have sealed that game anyway. I win the dieroll and get a near perfect hand of: Forest, Mountain, Llanowar Elves, Primal Forcemage, Kodama's Reach, Blazing Salvo and Glitterfang. Definitvly a keeper. I do the same as always and then pass. He plays a forest and passes. I draw Oxidda Golem, play the mountain, reach out and grab a forest and a mountain, putting the last directly into play. He lays a plains and plays a Howling Mine. Fine with me. I draw a Lay of the Land and sandstalker thanks to his mine. I go: Forest, forcemage, lay for a mountain (using elf mana), and Glitterfang. I also attacked for 4. He just draws his cards and concedes. Did I mention that some people seem to dislike really fast aggro decks? Well, this time I had a very good starthand and his mine helped me more then him, so I won't complain. On his next turn he would have had only 1 lifepoint left without a blocker. So, that's it for today. I skip the deck evolution part this time since I gave you two decks to tinker with, when you don't like it, speak up in the poll-thread on the boards. I already have a good idea for the next article, expect it to be live faster then last time. It will be a bit different, but that will give me more time to use the input you folks will give me. MTGO Traders said the spacing in comments was fixed. Record timing to my second post, too, thank you very much. Sadly, I don't have a lot of useful information to add to this article. Extended isn't really my thing. I was mainly just wanting to test out the bold/underline heh. Good old Power Conduit. A mainstay in my Phoenix deck, interesting take in removing age counters. Primal Forcemage deck on the cheap is quite impressive, though I might like to point out a nice little Torment uncommon, Centaur Chieftain, one of the few pre-PLC green cards with haste, with a great mini-overrun threshold kicker. I never thought about that one, simply because I never owned or played that one. Well, the only downside with him would be that the deck must be completly rebuild to work with him, since it won't reach threshold fast enough in this version. Please tell us who he is! Uhm, I didn't name him simply because I wasn't able to ask his permission to do so before he left.